Incontinence remains a taboo topic of conversation, with many sufferers too embarrassed to broach the subject with a doctor.. In a 2004 US survey, it was reported that on average women wait 6.5 years and men 4.2 years after beginning to experience their symptoms to seek advice. Currently it estimated that there are three-six million people in the UK with some form of incontinence, with between 25-30% of women aged between 45 and 65 thought to suffer . Avoidance tactics due to embarassment often result in anxiety, depression and even impact on overall physical health. So why does bladder weakness occur? The main culprit is a weak pelvic floor which often develops as a result of pregnancy/childbirth or ageing. However we should not accept bladder weakness as an inevitable part of growing older. The most common forms of incontinence include over-active bladder (the need to urinate often- defined as more than 8 times in a 24 hour period), stress incontinence (the need to urinate when additional pressure is placed on the abdomen in the form of a cough, sneeze, laugh etc.) and urge incontinence (the strong impulse to urinate, followed by involuntary urination). Although less common, faecal or bowel incontinence (FI) affects approximately 1.4% of the general population aged over 40 years of age, the reasons for which vary greatly but generally due to a weak pelvic floor (as a result of childbirth, ageing etc.) or nerve damage. Don’t worry though; there’s certainly action we can take to treat the varying forms of urinary/faecal incontinence. One well established and proven treatment is sacral nerve stimulation (SNS), also known as sacral neuromodulation. So what exactly is Sacral Nerve Stimulation? Well, it involves passing a mild electric current through the body to stimulate a contraction in the desired location. When the nerves and the brain do not communicate effectively, it results in the body not performing as it should (in this case the bladder or the bowel). This type of treatment is designed to imitate the signal ordinarily sent via the central nervous system. One of the major nerve routes is from the brain, along the spinal cord and through the back. This is commonly referred to as the sacral area. This area is what controls the pelvic floor, urethral sphincter, bladder and bowel. The signal manipulates a contraction within the pelvic floor, over time rebuilding the strength of the organs and muscles within it. This effectively alleviates the symptoms of urinary/faecal disorders and in many cases eliminates them completely. The sacral nerves are located at the base of the spine which is where the stimulation must be applied in order for it to be successful. This type of treatment can also be used to relieve symptoms of constipation (which affects between 3-15% of the population) and urinary retention (inability to completely empty the bladder). But isnt Sacral Nerve Stimulation (SNS) with implanted electrodes a surgical procedure? Yes, there is a minor surgical procedure, involving permanently embedding a neurostimulator within the body to transmit the electrical current. Prior to treatment, the patient must undergo a trial period in which a wire is temporarily implanted to test the patient’s response. Only if symptoms improve by over 50% will they be deemed suitable for SNS. Following a successful trial period (which typically lasts 1-2 weeks), the sacral nerve stimulator can be implanted. The long term success rate of SNS is believed to be between 50-90%. Despite the success rates, many people who do not experience a ‘significant’ improvement during their trial period are not able to proceed with treatment. So is it really fair to say that anything less than a 50% improvement is negligible? For those that suffer with bladder or faecal incontinence, any improvement is huge. For some, the mere mention of sacral nerve stimulation conjures up images of an invasive medical procedure resulting in a foreign object being permanently placed in the body. What if we told you SNS can be applied via external electrode pads, and can even be carried out in the comfort of your own home? It’s true; you can achieve the same results yourself with the simple use of external electrode pads. Many, unaware of this and the options available to them, are prescribed drugs to treat their disorder, or opt for this invasive medical procedure to be carried out. Side effects are common with any drugs, in some cases actually aggravating the problem that they are designed to treat. Research suggests that almost 80% of incontinence patients discontinue the use of drugs in the first year with up to 17% of these cases being due to adverse side effects. Similarly, all surgical procedures, regardless of how minor, always carry some degree of risk. With Percutaneous (implanted through the skin) SNS, adverse reactions can include bleeding, swelling, pain or infection. Because of the nature of faecal incontinence, it is possible to treat not only bladder weakness using a SNS neuromodulator, but bowel weakness and incontinence problems too. SNS was introduced as a treatment for FI in 1995, and in a study carried out by GUT (an international peer-reviewed journal for health professionals and researchers in gastroenterology and hepatology) into the results of transcutaneous (external stimulation) SNS on faecal incontinence it was reported that 20% of the group tested achieved complete continence. All others saw a significant reduction in the frequency of the faecal incontinence episodes and an improvement in the ability to defer defecation. This demonstrates the efficacy of this type of external nerve stimulation on FI. 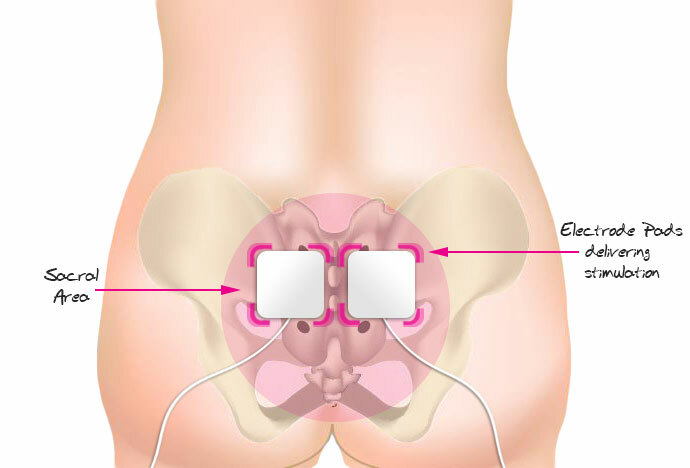 Sacral nerve stimulation using external electrode pads is one of the most effective treatments for bladder and bowel weakness. So, if you want to want to take back control, and start enjoying life again, SNS could be the answer. Where can you find this magical device that promises to deliver effective SNS without the need for a surgical implanting procedure? You guessed it; right here! When it comes to strengthening all muscles in the pelvic floor, the Kegel8 has been revolutionary for both women and men worldwide. The Kegel8 Ultra 20 Electronic Pelvic Toner and the Kegel8 V For Men Kegel Exerciser For Men come complete with a probe attachment, as well as four electrode pads. These electrode pads can be used for highly effective sacral nerve stimulation, increasing the strength, function and control of your bladder and/or bowel. Some people may choose to carry out manual Kegel exercises to treat varying forms of incontinence. These can be highly beneficial if performed correctly. However, often they are not, which can lead to greater pressure being put on the pelvic floor and abdomen. This is likely to exacerbate the problem over time. Our devices are developed alongside leading clinicians and are proven to deliver optimum results. By using once or twice daily, you will see incredible results within a matter of weeks. So, if you want the strength to combat weakness, read more about the Kegel8 Ultra 20 Electric Toner and the Kegel8 V For Men Kegel Exerciser For Men now!